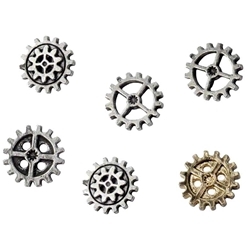 Set in a myriad of different gear-like shapes, these Medium Gearwheel Steampunk Buttons are sure to make a stylish impression on anyone who sees them. Make any garment a steampunk ensemble with their help. Masterfully cast and beautifully detailed, these gear buttons are excellent replacements, or additions, to any piece of attire that needs either flavor or variety, including that little personal touch that only a gearwheel can add.